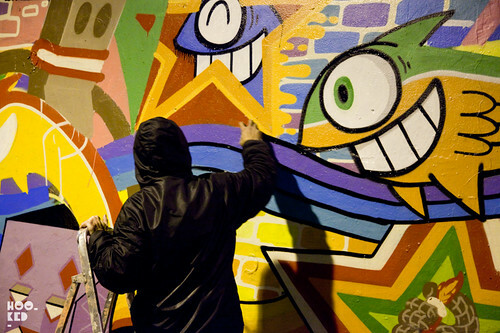 Last night saw Hookedblog catch up again with Spanish artist PEZ. Having already painted a number of street art pieces around London here and here during his time in the city as well as some collaborative shutters with London street artists Malarky and Sweet Toof, PEZ managed to get one last wall in last night before his departure this afternoon. 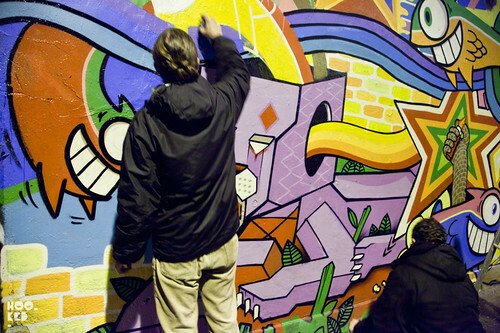 Despite last nights heavy rain fall and the miserable cold conditions the artist worked through on producing this colourful fun wall which saw him collaborate with fellow Spanish artist Dibo who has just recently landed in London. 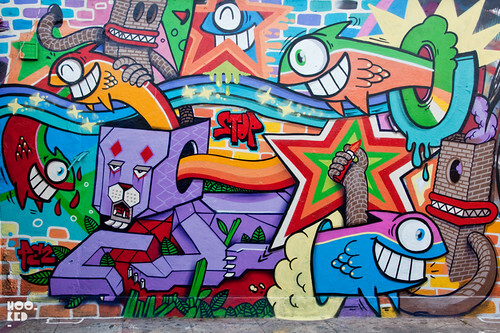 This new piece is located on Pedley St, off Brick Lane. If you are in or near London, PEZ's 'Smiling since 1999' exhibition will run at Tony's Gallery until the 6th May 2012.Should you not be able to make the show we have posted a selection of images from the exhibition over on the Hookedblog Facebook page, go have a look. It's fly. Reminds me of Mark Kistler's "Imagination Station" type stuff.